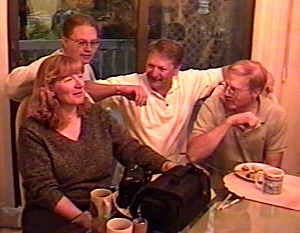 In April 2000, the four children of Thom and Vi Foulks gathered for a reunion in Toledo, Ohio. From the left, here's Kathy, Dana, Thom (Jr.) and Joe. [Clicking on this picture will take you on a full photo tour with the Foulks family.] The four had travelled from California, Wyoming and Colorado for a tour that would take them to historic family sites in Illinois, Indiana and Ohio. Our links begin backwards from Jonathan Tyler Foulks, son of Thom, Jr. A tour through these files will take you back through thirteen generations, all the way to the Welsh countryside of 1500s England and families whose surnames were Morgan, Taylor, and Bronaugh. You'll meet a Morgan -- a Foulks great-grandfather -- who was a friend and Revolutionary War compatriot of George Washington. Another Foulks -- a great-uncle -- was a famous Indian scout. Two ancestors arrived in America as trans-Atlantic stowaways (one from England, one from Germany), and both were indentured in the Colonies to pay for their passages. A Fisher ancestor was one of the first settlers of Kansas. A Lydy is a family Civil War hero for simply surviving the inhumanity of the Andersonville prison camp. There are also great-aunts with significant roles in American history. We continue to seek Foulks links branching from Columbiana County, Ohio; Beaver County, Pennsylvania; and Loudon County, Virginia, in the 1760-1840 era; as well as the early 1900s in Indiana. Can you help? Unless otherwise noted, all narrative information at this site is © 2000, Thom Foulks, Colorado Springs, Colorado. Thom (Thomas Eugene) Foulks, Sr.
You are the [an error occurred while processing this directive] visitor since Jan 1, 1999.